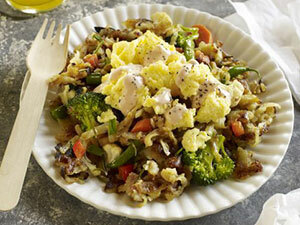 Breakfast customers don’t usually get a big helping of vegetables with their order, but this hash delivers. Along with the expected potatoes, there’s broccoli, cauliflower, carrots, bell peppers and green beans—a vitamin-rich combination to beat the morning-after blahs. Wash potatoes and place in large pot; cover with cold water by 3 inches. Over medium heat, bring to a boil. Cook until tender but still firm, 15 to 20 minutes. Remove potatoes from heat; drain and cool on wire rack. When cool enough to handle, shred potatoes into large shreds. Chop broccoli into bite-size pieces; blanch with carrots in salted boiling water for about 3 minutes, then shock in ice water. Do not overcook. Chop cauliflower into bite-size pieces; roast in 350°F oven for 10 minutes. Toss cauliflower with 1 tbsp. olive oil and dash of salt. Blanch green and yellow beans in salted boiling water 3 minutes. Heat 2 tbsp. olive oil and 2 tbsp. butter in large skillet. Add onion; sauté until caramelized. Add bell peppers, sauté 5 minutes longer. Stir in potatoes; sauté about 10 minutes. When potatoes begin to brown, add blanched and roasted vegetables and chopped herbs. Cook until potatoes are golden brown and vegetables are warm and tender. For Nunya Sauce: In small bowl, combine sour cream, lemon juice, ketchup, hot sauce, salt and pepper. In a separate sauté pan, melt 1 tbsp. butter. Beat eggs with milk; add to skillet and scramble. To serve, top large serving of hash with scrambled eggs; drizzle with Nunya Sauce.